HiltonHead.com » Give the Gift of Golf this Season. Give the Gift of Golf this Season. Discover creative holiday gift ideas for the golfer in your life. The holiday season is the ideal time to remember your favorite golfer. Here are a few thoughts about the gift of golf, as well as great golf gifts. 1. The gift of golf includes fresh air, big skies and laughter. 2. The gift of golf involves time together, exercise and sunshine. 3. The gift of golf provides opportunities for personal growth and achievement. 4. The gift of golf can provide healing, both mentally and physically. 5. The gift of golf can ignite a purpose and passion for a healthy habit. 6. The gift of golf gracefully teaches how to develop one’s potential. 7. The gift of golf is fun with friends new and old. 8. The gift of golf leads us to the truth. 9. The gift of golf brings instant joy and lasts a lifetime. 10. Round of Golf – Your loved one can tee off where Tiger and Phil have played at the Arthur Hills Golf Course or the Robert Trent Jones Golf Course, known as an Island favorite. 11. Golf Lessons and Certificates – Golf lessons can positively bring elation to a new or mature golfer. Plus, the improved play will last a lifetime. 13. Logoed Clothing – Golf shirts, wind breakers and pullovers are practical and prestigious, on or off the green. 14. Instructional DVDs – Your favorite golfer can keep learning the game, even when he or she is off the course. 15. Clubhead Covers – Add class and protection for your loved one’s cherished golf clubs. 16. 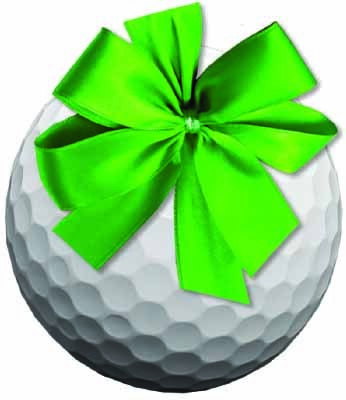 Stocking Stuffers – Popular items include golf balls, ball markers and range finders. 17. Golf Fashion – The award-winning Robert Trent Jones Pro Shop is a one-stop shop for Greyson Clothiers, offering innovative style and unprecedented performance. Plus, discover Jamie Sadock’s Ladies Golf Apparel, action- oriented resort fashion clothing for women by Peter Millar and finely tailored lifestyle and golf apparel for men. 18. Odyssey Red Ball Putters – This face-balanced mallet putter with a Red Ball scope and Versa high-contrast alignment is a must-have for any serious golfer. Remember, golf is always in season! Happy Holidays to one and all. I hope to see you out on the green! A former PGA Tour pro and member of the local golf Hall of Fame, Doug Weaver is the Director of Instruction at the Palmetto Dunes Golf Academy. He conducts “Where Does the Power Come From?,” a free clinic and demonstration, every Monday at 4 p.m. (843) 785-1138, (800) 827-3006 or palmettodunes.com.